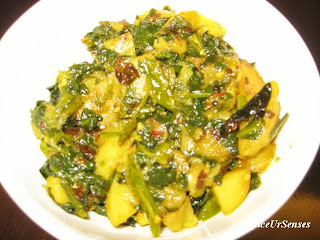 Aaloo Palak is an everyday food during the season of spinach, so I have used little amount of spices and vegetable oil to make it nutritious and healthy even after cooking. Aloo Palak can be eaten during lunch or dinner. This is very easy to cook, first time i made this aaloo-palak stir fry and it turn out to be very taste. Basically i add red chilly because i love to eat spicy food. Add palak, salt and cook it for 5minutes. Delicious i was searching for some other recipe but i end up looking at ur recipe... i taste really very good and spicy.